If you want to provide a safe outdoor area for your family to enjoy, removing potential tripping hazards— like a stump— can help. You can count on ACE GALLAGHER STUMP GRINDING SERVICE, LLC. to make sure your stump removal leaves you with a clean, safe yard. We strive to provide reliable, speedy service in Morristown, New Jersey. ACE GALLAGHER STUMP GRINDING is a full-service company that has the knowledge, experience, and latest technology that's needed to service all of your commercial and residential stump grinding needs. Since 1989, we have been providing top-quality services at competitive prices. Stump grinding can be done where grass is to be planted, to make room for a new tree, or to clear the way for a driveway, paving stones, or poured concrete. In all cases, the process is virtually the same, although we often need to go deeper when preparing the specific area for paver stones, driveways, or a new tree. Typically, a tree stump is ground to 8" to 9" below grade to enable you to plant grass. All visible surfaces roots are ground to the same depth as the stump, and our stump removal process turns your tree stump into useful mulch. If you're looking for an affordable way to spruce up your yard, we can help. At the end of our process, all of the mulch is raked neatly back into the newly created hole. All walkways and surrounding areas are blown clean as well. 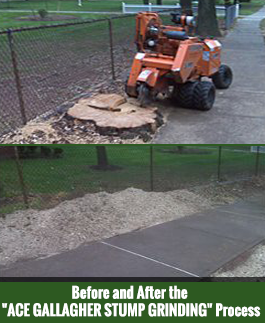 Serving many municipalities, ACE GALLAGHER STUMP GRINDING is Morris County's premier stump grinding service. We work with boards of education, more than 20 major tree companies, more than 100 landscaping companies, and federal parks departments, including the Thomas Edison National Historical Park; Jacob Riis Park in New York City; Ellis Island; Liberty Island; the Housing Authority of the City of Elizabeth, New Jersey; Washington's Headquarters; Jockey Hollow; and Fort Nonsense in Morristown, New Jersey. We have serviced thousands of residential properties over the past 27 years, so we know exactly what we're doing. All calls are returned within 24 hours, and all stump grinding is done by "Ace" himself— no subcontractors. Most work is completed within five business days. ACE GALLAGHER STUMP GRINDING SERVICE, LLC.